I miss you messages for ex-husband: Divorce is a funny thing. It is a result of anger and hate but its aftermath reminds you of love all over again. Signing divorce papers may have brought an official end to your marriage, but that is not going to wipe the beautiful memories of your marriage away. Children, homes and mutual friends are some of the things which will be a constant reminder of the past. Moving on is not easy and forgetting people is nearly impossible. Don’t feel depressed if you are missing your ex-husband, it is only human. 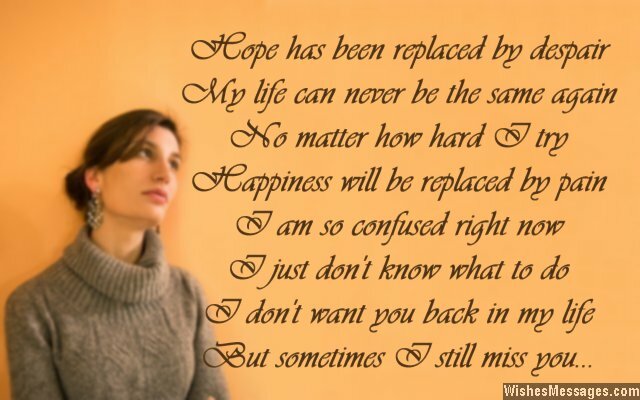 This post is a heart-wrenching mix of touching quotes and sweet messages – read them and take ideas if you are planning to write an I Miss You message to your ex. 1) I miss you, even though you are the only person in the whole world who I hate more than I love. 2) No matter where life takes me, no matter what I become. I will always be grateful to the man, whose children call me mum. I miss you. 3) We have both moved on in life. But let’s not forget where we came from. I miss you. 4) Weeks, months and years have gone by since the day we signed those divorce papers. But the memory of our marriage still lingers around in my mind like a scented vapor. I miss you. 5) We will never be able to get back together, but for the sake of our children let’s build bridges so that we don’t move further apart. I miss you. 6) Over the years that have gone by after our divorce, I have realized that my heart has no room for any more hatred but there is still some space left for forgiveness. I miss you. 7) Our marriage wasn’t the biggest mistake of my life. It was a wonderful journey which was brought to an abrupt end by fate and destiny. I miss you. 8) There is nothing I can say or do that will change our bitter past, but there is something I can say that might change our bitter future – I miss you. 9) Until now I had always thought that living your dreams is the hardest thing to do in life. But it isn’t, accepting reality is. I miss you. 10) I will never try to push you out of my life completely because I would never want that. Our marriage was, is, and always will be something that I will never regret. I miss you. 11) Our marriage wasn’t a mistake. It was something that just wasn’t meant to be. Regret isn’t going to help me move on. Accepting the fact that I still miss you brings solace to my broken heart – at least our love was real. I miss you. 12) Missing my ex-husband is a feeling that conflicts with my reality. In fact, it is such a strong feeling that it often makes me question my reality. 13) My heart still thinks that our marriage ought to be given a second chance but my mind knows that it will never work out. While my heart and mind battle it out until my last breath, I just want to let you know that I miss you. 14) Our marriage didn’t work out and our bitter battles have caused a lot of pain. Despite the divorce I will never forget you, even though I will never love you again. 15) Marriage was easy, divorce wasn’t. Moving on was easy, but missing you isn’t. 16) Hope has been replaced by despair, my life can never be the same again. No matter how hard I try, happiness will be replaced by pain. I am so confused right now, I don’t know what to do. I don’t want you back in my life, but sometimes I still miss you. 17) We loved, we argued, we cried, we fought, we divorced – I wouldn’t change a thing. I miss you. 18) Never is a word that I have removed from my vocabulary on the day that I realized that Never Thinking About You Again was just not possible. I miss you. 19) We may not be able to UNDO the battles of our past, but let’s make sure that we don’t REDO them either. I miss you. 20) I still can’t understand how the man for whom I gave up everything for, became the reason I was willing to give everything up for. In this confused state of mind, all I want to say is that I miss you. 21) Before we got married, I had many reasons to love you. While we were married, I had many reasons to be angry at you. After we got divorced, I had many reasons to hate you. But after all these years, I have many reasons to miss you. 22) Divorce broke my heart, life has driven us apart. I am now your ex-wife, but I miss you sometimes because you were once my entire life. 23) It hurts to think that our marriage did not work out. But it hurts more to realize that I can’t stop missing you. 24) I never doubted my love when we got married. Even today, I don’t. I miss you. 25) Our marriage didn’t work out in the way we expected to, but I am not going to hold that against you forever. I am a strong woman who has moved ahead in life. I have no qualms in accepting that there are still moments when I miss you. 26) I never knew that I would be saying I Hate You and I Miss You to the same person, who was once my husband. 27) Our children deserve to know that their parents are committed to their roles despite the divorce. And even though life has moved on for the better, you deserve to know that I still miss you and will continue missing you because nothing can change the fact that you are my child’s father. 28) Things will never be the same again. Thinking about you always brings me pain. I don’t want to get back together, but your place in my memories can be taken by no other. I miss you. 29) Our divorce is like a ghost that haunts me every night. I miss you. 30) Sometimes I sit and wonder when I look outside my window, how my marriage with a wonderful man came to a crumbling end. Life can sometimes be so amazing and sometimes so cruel. But it is what it is and we must all move on. I miss you. 31) Sending you this text may be the biggest mistake of my life after our divorce. But if I don’t, you will never know how I feel – I Miss You. 32) The memories of our marriage are an anchor which don’t hold me back from moving forward, but stop me when I am moving in the wrong direction. I miss you. 33) There are some people who come into your life and wreck it apart. Even then you miss them because the love was more intense than the wreckage. In my life, that person is you. I miss you. 34) Our marriage – my life’s most beautiful memory and worst nightmare at the same time. I miss you. 35) Our children deserve to see their parents put up a unified show of love, commitment and support. For the wonderful husband-wife couple that we once were, and for our beautiful children, let’s forget our differences and embrace the reality. I miss you.